Oh yes!!!!!!! If you're anything like me, you're always looking for a way to earn FREEBIES with those coupons from the Sunday paper. This Sunday, we're expecting 5 coupon inserts and you're going to want to have lots of coupons!!!!! . One of the hottest coupons in the inserts tomorrow will score us FREE razors at Walmart!!!!! Be sure to grab lots of the $3 off Bic Razor coupons from the July 27th Smart Source Coupon Insert. 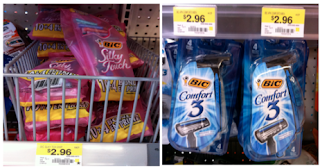 Its at Walmart that you'll find the Bic Comfort 3 or Bic Silky Touch Razors for ONLY $2.96, making them a MONEY MAKER after coupon.